This is a photo showing U. S. Army troops on the grounds of Fort Harker, Kansas. Fort Harker (originally called Fort Ellsworth) was established in 1864 in order to provide protection for the Kansas Stage Line and military wagon trains transporting goods along the Smoky Hill Trail and the Fort Riley Road. 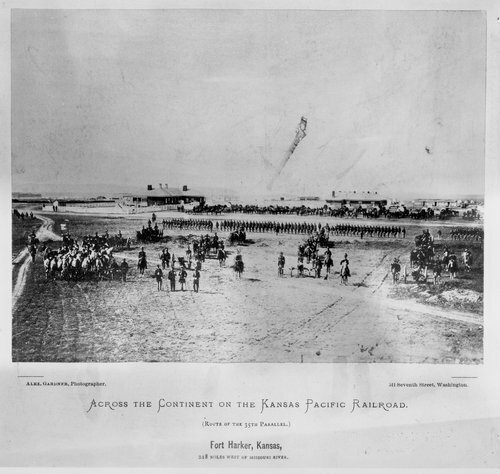 The fort closed in 1872 and was located in present day Kanopolis, Kansas. It is from Alexander Gardner's series, Across the Continent on the Kansas Pacific Railroad.